Microwaves101 has a lot of visits from radio enthusiasts. So it's time we welcomed them with their own page on amateur radio! If any Ham has content that they'd like us to post, drop us a line! Here's the Wikipedia story of how the word "ham" came to refer to amateur radio. Here's a link to web site of the American Radio Relay League, a.k.a. the National Association for Amateur Radio. Go to our book section and order a copy of the ARRL Handbook from Amazon. You can get used copy for just a few bucks, we did and we like it! Radio, when you think about it, was invented by amateurs. It took years before big companies such as General Electric, RCA and AT&T screwed it all up by commercializing it. You can learn about some of the pioneers of radio in our Microwave Hall of Fame. Check it out, John D. Kraus (W8JK) is also in the Hall of Fame! 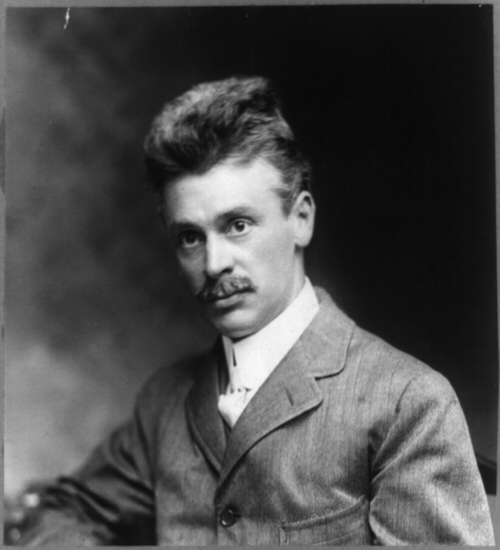 Here's a public domain image of Hiram Percy Maxim, who founded ARRL in 1914. ARRL now boasts about 105,000 members. If anyone wants to collaborate on an ARRL project, maybe we can help facilitate that. Example: how about a printed circuit board for a 24 GHz radio? All About Circuits (an extremely active electrical engineering online community that provides both interesting content and useful resources for electrical engineers, including various engineering calculators as well as a free electrical engineering textbook.) Suggested by Kent! Welcome to Earth-Moon-Earth Home Pages. I noticed you missed a great page on ham radios: http://www.answerconnect.com/articles/the-ham-radio-resource-guide . It looks like a very nice overview on hams, it provides a nice overview, along with providing links to very resourceful pages including technical specs, call signs, terminology, licensing, and equipment.